Sunshine Harvester Primary School adopted the ‘SWPBS’ (School Wide Positive Behaviour Support), or PBS framework as we call it, in 2014. PBS is a framework to help organisations such as schools set a positive culture based around core values. (Staff and students selected the values of RESPECT, RESPONSIBILITY and LEARNING in 2013.) We then create a matrix to show, and to teach what these values look like in all the different contexts of the school. To see our PBS Behaviour Expectations Matrix, click here. We focus on different expectations in different settings throughout the year, teaching the expectations, and reminding students of expectations as they move through the different contexts so that we can help all students be successful learners and citizens. 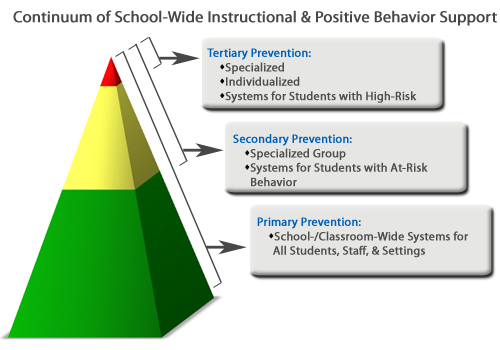 We seek to prevent situations that lead to behaviours of concern, teach alternatives, and reinforce expected behaviours. We use “High Five cards” as a way of talking with students about the appropriate behaviours they have used. These cards can be spent at our “PBS place” for things such as time helping in another grade, small items, a little bit of free time – and with bigger amounts, even things like lunch with the Principal and other teachers of choice, or movie tickets. PBS is what is called a ‘multi tiered system of support”. So we also have group supports for students who may need extra support, just like we do with academic needs. We plan individual support plans where needed. We use the powerful strategy of video modelling as a key way of teaching students expected behaviours. Within the PBS framework there is still a need for consequences at times, but we seek to discuss consequences in a calm setting, and work hard to support a student who is making behavioural mistakes by preventing things that may set a behaviour in motion, teaching alternative behaviours, and reinforcing correct behaviours. You are always welcome to ask questions and learn more about PBS at Sunshine Harvester, or how you can adapt it for home use too.